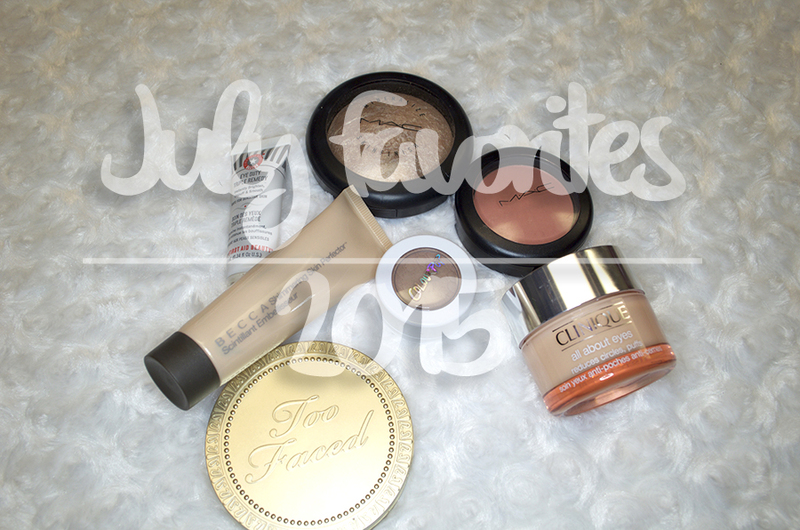 So I know it's been plenty of days past July but I still wanted to post my July favorites only because I don't want to wait till the end of August to post my favorites. Every month my favorites are changing so it wouldn't be fair to skip July. I would've posted this sooner but I had been so busy with figuring out college stuff as well as my Youtube channel, if you haven't subscribed or checked out my videos then please click here. I've been trying to think of content for this blog as well as my channel which was why I haven't been posting as frequently. Anyways, lets get to the favorites. I never used an eye cream until I started experiencing dry eyelids, for some reason as it changed from winter to spring my eyelids became extremely dry to the point where my regular moisturizer still wasn't enough. I tried so many after that such as the Origins Eye Doctor Moisture Care For Skin Around Eyes, which I thought was amazing at first. It still made my eyelids dry but under my eye felt moisturized which was all I wanted (so I thought), a moisturized eye area. But after thinking all of it worked, I realized that there was tiny little bumps appearing under my eyes so I stopped using the eye cream and it slowly went away. It's still there but it isn't as noticeable as it was when I used that cream. After a while of doing research I realized exactly what I was looking for, I wanted an eye cream for my eyelids and my under eye area. Many brands recommended their eye creams for under the eyes only but I found that Clinique's All About Eyes eye cream was gentle enough to be used for both area that I needed it to be used for. I was skeptical at first because of my bad experience with the Origins eye cream so I purchased the smaller container of the Clinique eye cream, and I went through it so fast because it was that good! My eyes were no longer dry! I didn't notice if it made a huge difference on the appearance of my skin or not but I loved the way my skin felt when using it. Anyways, when I finished the entire container I knew I had to buy a new one but I didn't want to spend the money. I went a month without the eye cream and suffered with dry eyelids again so that's when I decided to make a repurchase and get the bigger size as well. It's the best eye cream I ever used, well out of the two I've used this is the best and I will probably being purchasing this eye cream forever until a new eye cream product comes out that is better than this. Skincare was never anything important to me when I was in high school only because I never knew much about it. All I knew was face washes from drugstores that broke me out and gave me rashes which was why I always stayed away. But when I started college that was when I was crazy over skincare. I was always trying new things out and researching products. When I bought a gift set that contained First Aid Beauty's Eye Duty Triple Remedy I was blown away by how different it was than anything I ever owned. I'll admit that when I first swatched this onto my hand I thought that it was the weirdest thing ever. I kept wondering why it was peach colored, it wasn't going to blend in with my skin tone, definitely not. This product was left at the bottom of my makeup drawer but soon I decided to start using it. I had to wake up at 5 am to get ready for class and I thought that since it was an early class, I'm bound to look tired either way. The first thing I did was prime my face then put some of this under my eyes and as I used the metal applicator to blend it out I couldn't believe my eyes. No, really. The metal applicator was so cooling that it made me feel less tired and the peach canceled the under eye darkness I had from sleeping so late for the entire week. But after falling in love with the product I soon forgot about it because I moved on to other products, but last month I started cleaning up my makeup and rediscovered this. Ever since then I've been using it under my concealer, it gives my under eye a brighter look. I was never much of a highlight person but there was so much hype over cream contouring and highlighting that I needed to get some new products. Since I have oily skin highlighting was never really my thing, I was always afraid of dewy looking skin especially since it makes me look oily. But I decided to get the Becca Shimmering Skin Perfector to see how I like the liquid highlight and I hated it. "It's horrible," I would think to myself over and over again, but the reason why I hated it so much was because I didn't know how to apply it. Was I supposed to apply it before powder? Was I not supposed to wear powder? It was all too confusing to me until I decided to change up my routine. After my primer I would apply this product to the areas I wanted to highlight like my cheek bones, the tip of my nose and my cupids bow. When I'm finished with applying that I would go in my foundation and the glow was still there, just not as intense. The foundation and the highlight blend in perfectly that right after I would apply a face powder followed my a powder highlight which brings me to my next favorite. MAC's Soft & Gentle was my first highlight, at least from what I remember. I became obsessed with it until I finally purchased a Becca highlight then forgot all about it. But lately I've been loving this highlight layered with the Becca Shimmering Skin Perfector. Too Faced must be my all time favorite brand because I own so many different products from them. Everything is quality, the packaging and the actual product itself which draws me into their brand every single time. The only reason why I bought the chocolate bronzer in the first place was because I wanted my makeup to smell like chocolate, who wouldn't? It was such a pretty shade and very easy to work with but as I started getting more and more bronzers I eventually forgot about this one. I was going out to dinner one night and I knew I wanted a very natural look then notice the little gold packing peeking out from behind my NARS Bronzer, ever since then I started using this bronzer all over again. Now the last product was something I was skeptical about, Colourpop's products are known for being different than your typical makeup product. For example their blushes aren't cream blushes but they aren't exactly powder blushes either. I would call it a melted powder, I don't know why but that's what it feels like to me. Even though everything is highly pigmented, I was afraid to purchase eyeshadows from them only because I had a bad experience with the blushes not blending out the way I wanted it to. But since their products are so affordable I bought three eyeshadows, but my favorite was Hanky Panky. I thought they would be impossible to blend but it was actually really blendable, if you could blend cream eyeshadows with your brushes then you can blend these in. They applied smoothly and I had no problem with the eyeshadow. If you want something from Colourpop I would definitely recommend the eyeshadows over the blushes. What are your July favorites?